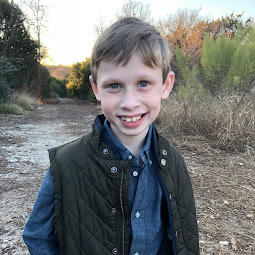 Bennett Brinson Gamel: Fighting Cystic Fibrosis: Bennett's Junky Cough. Ugh. Oliver has been sick one week out of every month this year. But each time he's come home with fever, a runny nose, a cough, Bennett has been able to stay fairly well. Until now. After Oliver had a 9-day cold virus that included 4 days of fever, Bennett started coming down with the same thing. For a few days, the boys overlapped with this virus. Brian and I caught small parts of it (sore throat, stuffiness). It was rough. But everybody has gotten better, except Bennett. 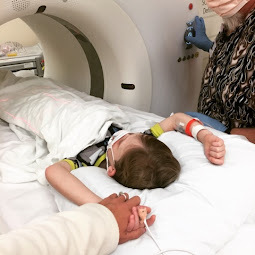 Bennett had his quarterly Cystic Fibrosis appointment on Friday. His cough and junky nose were not overlooked. His CF doctor took a throat culture, as she normally does. But said she would be surprised if he doesn't have some sort of infection. What I recently learned about CF (that I guess I really had not understood before now) is - this is when Cystic Fibrosis rears its ugly head - when a small virus or infection gets in the lungs making the mucus even more thick than normal. 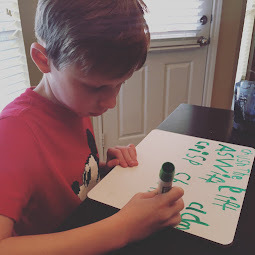 This thickening of the mucus, in addition to Bennett's inability to get rid of that mucus, makes Bennett's lungs susceptible to nasty infections that are difficult to get rid of. ...wet suckers don't mean to get dirty. But they always do. Even the smallest speck of dirt will stick to a wet sucker. Bennett's lungs are the same way. When he is sick with a normal cold or flu, it's like a sucker that becomes wet and sticky. The normal healthy lungs become very susceptible to the germs that exist around us - bugs like psuedomonas, MRSA, pneumonia, etc. Having CF is a bit like not having a broom in a kitchen where sugar keeps getting spilled on the floor. In a normal house, if sugar is spilled on the floor on a daily basis it will regularly get swept up and thrown in the trash, keeping the floor clean. But if that same house didn't have a broom (or a broom that didn't work very well), then the sugar would stay on the floor. Eventually ants would come to feast on all this free food. You might try killing the ants with insecticide, but so long as that sugar stays on the floor they'll keep coming. It's the same with CF. The mucus in Bennett's lungs is 'sugar' - something nutritious that bacteria love to feed on. Normally the cilia (little brooms on the cells inside the lungs) sweep this mucus away regularly. But in CF patients the cilia are crushed by the mucus (there is no layer of water for them to beat in) and the mucus remains. When various bacteria find their ways into his lungs, they find a pile of sugar ready for their consumption, as if the table has been set waiting for their arrival. Trying to clear these bacteria out of his lungs is a bit like trying to stop ants in your house feeding on piles of unswept sugar - they just keep coming. So, there isn't much we can do about keeping Bennett away from normal viruses, although we certainly try. But it's particularly important that we give him all the tools we have to help him stay as healthy as possible as he tries to fight these infections: more frequent breathing treatments, more frequent vest therapy, antibiotics, etc. 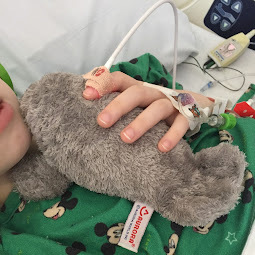 The hard part is that we know that, whether it be this cold or another respiratory infection down the way, eventually, Bennett's lungs will colonize with a bacteria that will be nearly impossible, if not impossible to rid. And once a bacteria like that settles in, the irreversible lung damage begins. We hope Bennett will kick this cold with little issue. We hope his throat culture will come back clean. We hope that this won't be the beginning of what could later turn out to be a hospitalization. But Brian and I see this a bit like driving on a long trip. We haven't arrived at this particular "exit" yet. But we know it's coming at some point and we're already anticipating it arrive upon us faster than we had hoped. To complicate matters, Bennett's CF Doctor thinks he may also have asthma. We won't know until he's a bit older and we have more clinical symptoms to know one way or the other. But his waking up coughing at night and signs he's struggling to get breath, even when he's resting, tell us he may be fighting asthma too. Brian and I aren't necessarily worried. But we are wanting to face this cold/virus with eyes wide open. We know of two little CF friends who have recently cultured Psuedomonas. And we know it's only a matter of time before our "lucky" lotto number gets pulled too. We are just trying to live every day with a very real feeling of being blessed by good health, while also preparing for the time when good health can no longer be taken for granted. Praying little man feels better soon and there is no infection. Your descriptions above are perfect for explaining to others how CF works. Every single one of them...especially the "exit" one. How perfectly that describes how us CF parents live on a daily basis. I just might borrow all of these. As always, I love your writing Breck!! Oh no! I'm so sorry that Bennett's sick, and I hope he can fight this off quickly - I'll say some extra prayers for you guys. Sorry to hear everyone was sick. Hope little B bounces back soon! Hope Bennett bounces back. Madeline has had cold/viruses in the past that take a LOT longer for her to recover from than anyone else in the family. But usually, she clears it on her own not needing antibotics or IVs. I hope that is the case for Bennett! ( we also just got over a 10 day cold/virus!- ugg!) Thinking of all of you and hoping for great culture results!